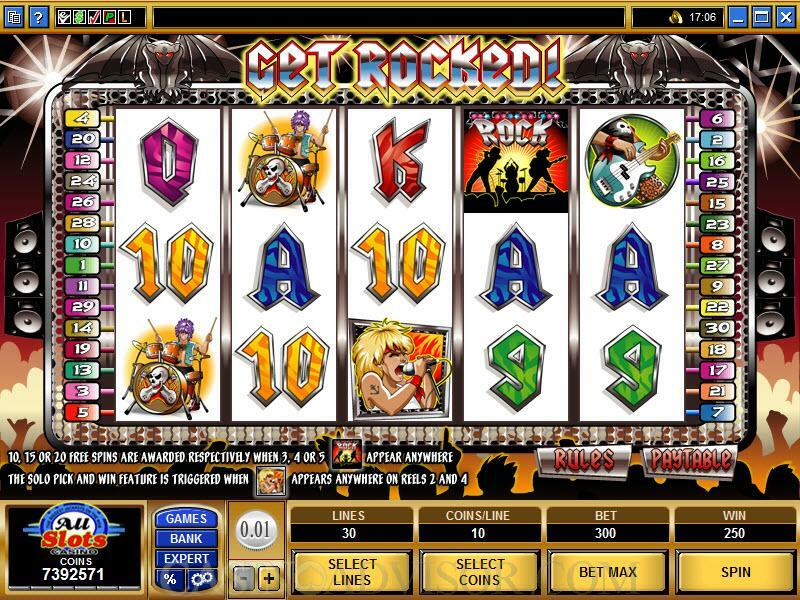 Get Rocked is a 5 reel and 30 payline online slot game from Microgaming. It is based on the popular theme of Rock and Roll. 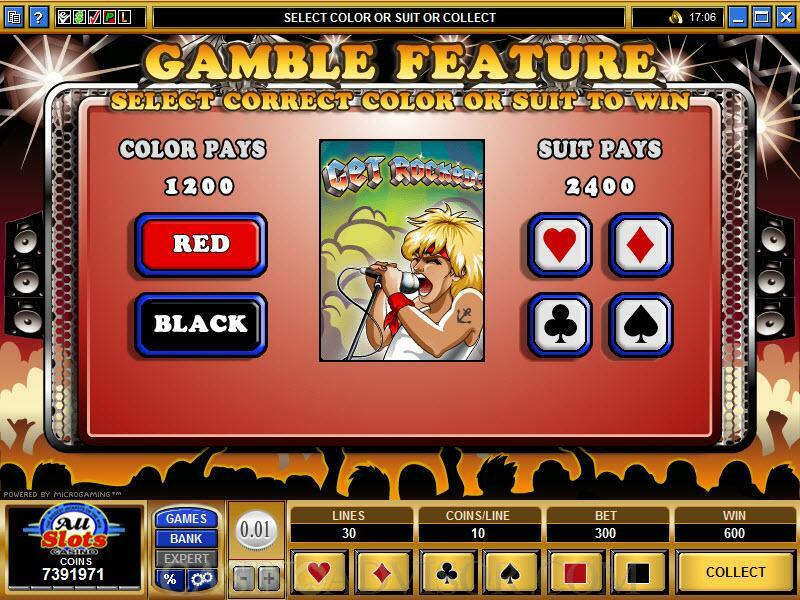 The slot game combines music, graphics and animation to capture the energy of Rock concerts. The music throughout Get Rocked is pulsating and authentic rock and roll. The reels are set in the background of the stage. When the Solo Pick and Win round is triggered the reels disappear and the five musicians come on the stage. The drummer is seated on a pedestal behind and the other four stand in a line in the front. The lights go on and the performance begins with the audience going wild in the fore ground. The coin denomination range in Get Rocked includes 0.01, 0.02, 0.05, 0.10, 0.20 and 0.25. The slot has 30 paylines and players can wager up to 10 coins per pay line. The maximum line bet works out to 2.50 credits and the maximum total bet works out to 75.00 credits. The Singer is the wild symbol, but it does not multiply payouts when it participates in winning combinations. It also offers the highest fixed jackpot of 5000 coins. When the Singer symbol appears anywhere on reel 2 and reel 4 simultaneously the bonus game on the second screen is triggered. This is called the Solo Pick and Win round. In this round the player picks one of the five musicians, who plays a solo item and random credits are awarded to the player. This round can be triggered during the free spins bonus round. The Stage is the scatter symbol. 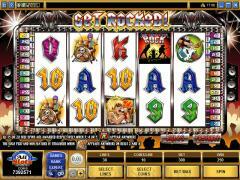 Two or more Stage symbols anywhere on the reels offer scatter payouts. Three or more stage symbols anywhere on the reels trigger the free spins feature. Three symbols give 10 free spins, four symbols give 15 free spins and five symbols give 20 free spins. The payouts are tripled and the free spins can be re-triggered. 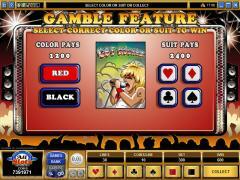 Get Rocked also features Microgaming’s standard Gamble Feature. Players can try to double or quadruple the payouts received from any spin. If they want to double the payouts they have to choose the color and if they want to quadruple the payouts then they have to choose a suit. If they choose correctly their payout gets doubled or quadrupled. If not they lose the payout altogether. The players can play this game till the limit is reached. If players do not want to risk their payouts they can collect the same without playing the Gamble Feature. The maximum winnings in the base game in Get Rocked can be 24,000 credits and in the free spins it can be 72,000 credits. Interested in reading more detailed information about Get Rocked? If so Click Here for more details.